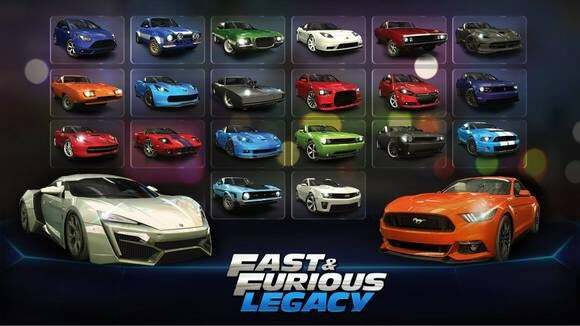 If you’re one of the millions of people that flocked to see Furious 7 this weekend, you might be eager to relive some of the big-screen thrills on your iPhone or iPad—and Fast & Furious: Legacy is ready and waiting for you. Here’s the bad news: It’s a free-to-play game that features multiple currency systems, timers that force you to wait for arbitrary reasons, and fair bit of grinding needed to unlock faster cars and later content. Got the higher-rated ride? Assuming you don’t blow this start or miss your shifting cues, you’ll probably take the drag race. Here’s the good news: Despite all of that being true and totally expected for this type of modern movie game, Legacy is actually totally reasonable in most of its freemium design. Better yet, it’s actually quite fun in moments, with plenty of presentational gloss and callbacks to the entire film series to pull you along. It might not be the richest or most complex racing game around, but it’s a good companion to the films. Looking for a directional pad, tilt controls, or an acceleration button? 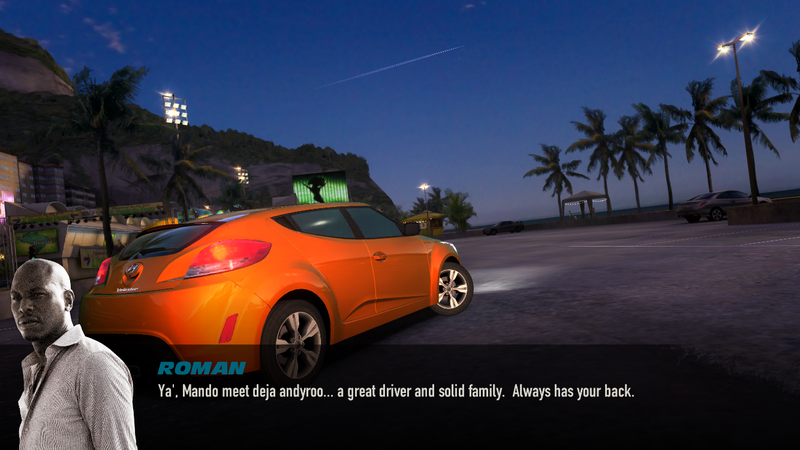 You won’t find it here, as Fast & Furious: Legacy isn’t a traditional racing game. Instead, it collects a series of driving-based events that feature simple controls and interactions. You’ll rev your engine and slam on the gas to start each mission, but from there, the game shifts into one of a few forms. 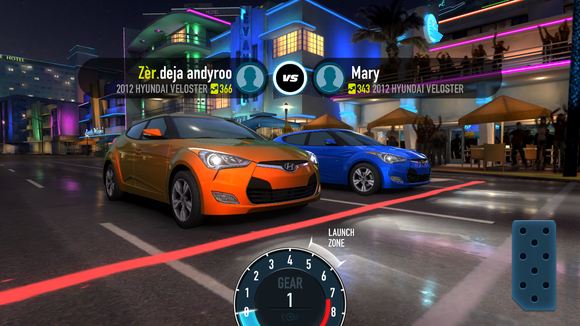 Drag races are very similar to freemium smash CSR Racing, in which you must shift gears to continue accelerating at peak speeds and beat your foe to the finish line. 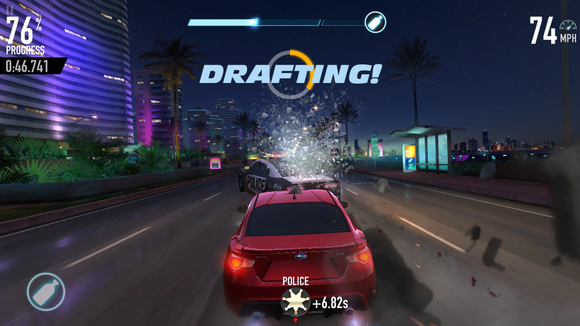 Street races, on the other hand, see you tapping to change lanes as you dodge traffic—and occasionally, police cruisers that try to slow you down by smashing into your ride. And drift events send your car spinning around turn-heavy courses, as you slide your finger left and ride to control its arc while whipping around turns. Police cruisers will pop up at times during street races, and they like to take sudden turns to block your path. Whoops. None of the events are particularly complex, but they’re all nicely executed for what they are, and the game lays the polish on thick. The glossy cars are impressively rendered, the backdrops feature eye-catching neon signs and other vivid details, and the rainbow effect while boosting nitrous adds some fun flair. And while only the B-players from the films have their likenesses recreated here (with still images and text), there’s enough light flavor to the dialogue to recall the movies’ notable characters and events. That’s high praise—thanks so much, Tyrese… I mean, Roman. The story bits are light, but they help connect the events to the film world. Much of the action unfolds through a story mode that bounces between Rio, Miami, Los Angeles, and Tokyo as you complete the various events. Challenge races ditch the narrative to provide extra ways to earn credits, plus special ranked events pop up from time to time. There’s quite a bit here to play, although if you want to dig deep into the storyline, you’ll need to get into the cycle of constantly upgrading your ride(s) to meet the rising challenge. Which is where freemium elements come into play, of course. Make no mistake about it: While skill has some part in the proceedings, Fast & Furious: Legacy is very much a numbers game. Got a car that’s rated higher than your opponent’s, due to how much you’ve upgraded it (or how impressive it was in the first place)? You’re likely to win, assuming you don’t intentionally bash into traffic, miss your shifting cues, or leave your nitrous tank untapped. Constantly upgrading your ride(s) is the name of the game. That big yellow number tells you how much of a shot you have against another driver. 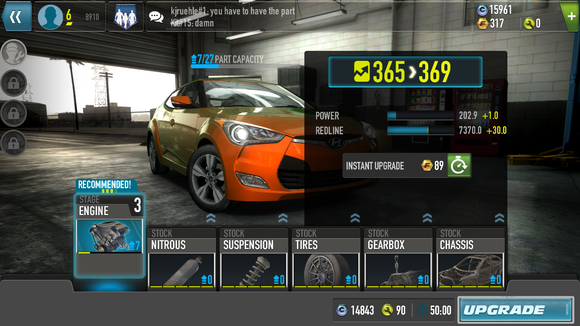 The game will even tell you how difficult the upcoming event seems based on your car rating, as if to nudge you into the shop to better prepare your ride. Like, “You don’t really think you’re going to win this one with that hunk of junk, do you?” Legacy doesn’t have any competitive online play, but working your way through the story means facing new and better-equipped computer rivals in the various events. And that requires continuously pumping your earned gold, silver, and repair tokens into upgrades. 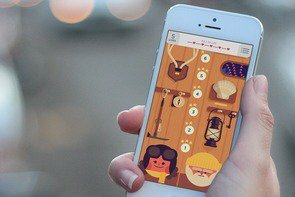 Luckily, there are consistent opportunities to earn all of those currency types if you play slowly and steadily. You’re given currency for advancing the story, completing challenge races, joining a crew, and logging in daily, and if you’re patient enough to play little chunks here and there, you can probably play for a long time for free. Gold is used to purchase new car crates, visual enhancements, and to supplement your other funds when it comes to repairs. Legacy does have some convoluted freemium elements, however, which are here only to stymie anyone eager to play large amounts without paying. The most obvious of them is the need to perform an oil change on your car after five events, which takes two or more hours of real time. You can own multiple cars, luckily, but if you’re focusing your money on upgrades for one, chances are the others won’t be as well equipped. Elsewhere, you’ll need to shell out gold for extra mechanic slots to repair multiple rides at once, plus “parts” and “upgrades” are two different elements for some reason, which only leads to confusion and frustration. Eventually, I hit a wall a few chapters into the story mode, where I ran out of coins for upgrades but the drift events ahead were clearly designed for faster cars. I could loop back into the challenge events for a few days and build some capital there, or I could spend real money to buy more gold for upgrades. 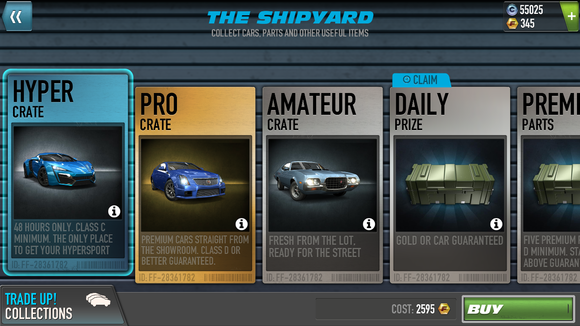 Limited-time car crates pop up from time to time, but you’d have to spend $20 on gold to grab one in a hurry. Saving up that much gold without paying must take weeks, if not months. A third option emerged: Dropping $10 on a pack of in-game gold large enough to buy a random “premium” car outright, which ended up being a 2013 BMW M5 with dramatically better specs than my lowly 2012 Hyundai Veloster. I jumped back into those drift events and immediately smashed through them, handily beating my foes by a few seconds apiece. See, it pays to pay in Fast & Furious: Legacy. Surprise, surprise. And still, I felt like it wasn’t totally necessary. 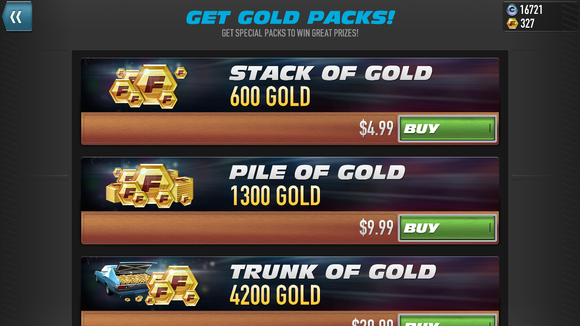 Sure, if you’re eager to make easy progress through the game, you might want to spend a few bucks early on to supplement your gold supply and buy a premium car. Just like buying a car pack in Real Racing 3, it can only help ensure you’ve got more to do without waiting. But there’s plenty to enjoy about Fast & Furious: Legacy without paying your way through digital oil changes and repairs. It’s not nearly as intense or rousing as the films it’s inspired by, but the quick-hit events and sleek presentation add up nicely and result in a freemium diversion worth sticking with.